Searching for flexibility and freedom in a play area? Look no further! 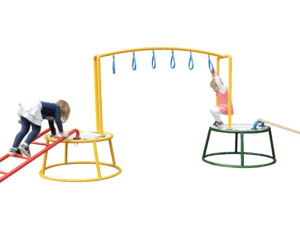 Playground Centre’s selection of moveable play equipment allows you to create new and exciting challenges everyday, as well as focus on the basics through variety and an assortment of fun. 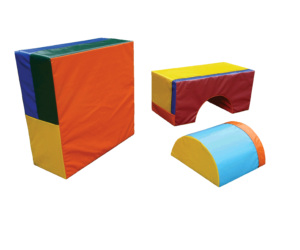 A fun fusion of robust, high quality PVC sleeved soft foam bases, tunnels, stages and activities that can be used on their own or with existing equipment. Combine towers, climbing nets, overhead and balance challenges and co-ordination activities. Mini moveable playgrounds with larger platforms that allow more children to explore and play at the one time. Our Mini-Bambino, Bambino and Young Explorer systems offer newfound fun for the littlies and flexibility, ease and affordability for the grown-ups. As educators and carers, you know that contemporary, up-to-date play equipment adds value to your Centre and your community. 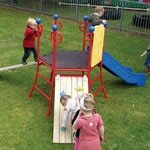 However new play equipment can often fall at the bottom of the funding priority list. Overcome that challenge by making the most of community funding and sponsorship opportunities in your area. Your local council may offer a specific program. Check their website or give them a call. Get Googling – for major community grant programs offered by gambling funds and major companies. Ask around. The parents of your Centre may be involved in an organisation that can help. Once you've found the right funding program for you, it's time to get started on preparing a knock-their-socks-off proposal. Make it easy to read. It may seem unimportant, but a cluttered document that uses different font sizes, styles, colours, busy backgrounds and too many illustrations can take away from your message. By all means, include relevant photos, maps or diagrams, but keep the number at a minimum and keep the formatting simple for maximum impact. Finally, read carefully. Follow the submission instructions, make sure you've included all the information asked for and get your application in on time! It's best not to submit the same blanket proposal to dozens of different organisations and expect an outcome. Applying for funding is just like applying for a job – put your best foot forward and tailor your approach to show you're serious about meeting their criteria. 1. Can I select colours to suit our facility and playground? A range of bright or environmental, natural colour palettes are available to create your desired look or suit any space / environment. 2. What size space is required? Different sized combos can be selected based on the space available. Further, the bigger the space, the more items that can be added in the future. Being moveable, the equipment is also flexible to fit into odd shaped areas. Refer to the Technical Specification sheets for dimensions. 3. Is the equipment covered by a warranty? 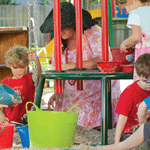 Playground Centre is committed to supplying quality, safe play equipment. Find out more about our warranty. 4. What is the expected delivery time of the moveable equipment? Playground Centre realises the anticipation and excitement of getting new play equipment. Therefore, we aim to deliver the equipment within four to eight weeks from receipt of the deposit. 5. What freight costs are involved? The cost of freight is included for major centres and metropolitan areas in New Zealand and Australia. Rural areas may incur an additional charge. Please advise your location and we can quote this for you. 6. Can the equipment be left outside? Like anything, all equipment will last longer if protected from external elements when not in use (ie at night and over the holidays). 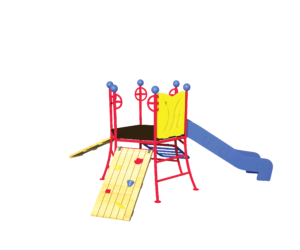 On a day-to-day basis, if necessary, the Young Explorer and Bambino equipment can be left outside, however it is recommended that timber items are stored away each day. The Mini-Bambino equipment should be stored indoors at the end of each day. 7. Is the equipment compliant to safety standards? Yes, the Young Explorer and Bambino equipment is fully compliant to Safety Standards NZS5828:2004 and AS4685:2014. 8. 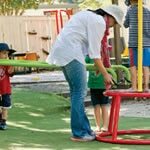 Does the play equipment require safety surfacing? 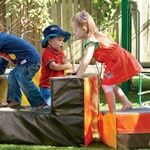 Under the safety standards, any play equipment with a fall height of 600mm or more requires safety surfacing. 10 Year Structural Warranty on steel and rotational moulded product that are found to have undergone structural failure. 2 Year Warranty on any moving parts such as connections, pumps. 3 Year Warranty on faulty product or workmanship. Warranties apply from date of invoice and the purchaser shall advise Playground Centre in writing of the defect. Harsh or corrosive elements where preventative procedures as set out in our Maintenance instructions - pages (1), (2) and (3) have not been adhered to. Repair or replace the part found in Playground Centre's judgement to have been defective in workmanship or material.